First things being first, I should probably mention that petals have a new tape out on Strange Rules. It is called Abstention and is now sold out out at source, but various distributors will have it in due course, as indeed will I. Get in touch if you’re interested. Strange Rules head honcho, Zen Zsigo, has described it as his “late summer soundtrack”. 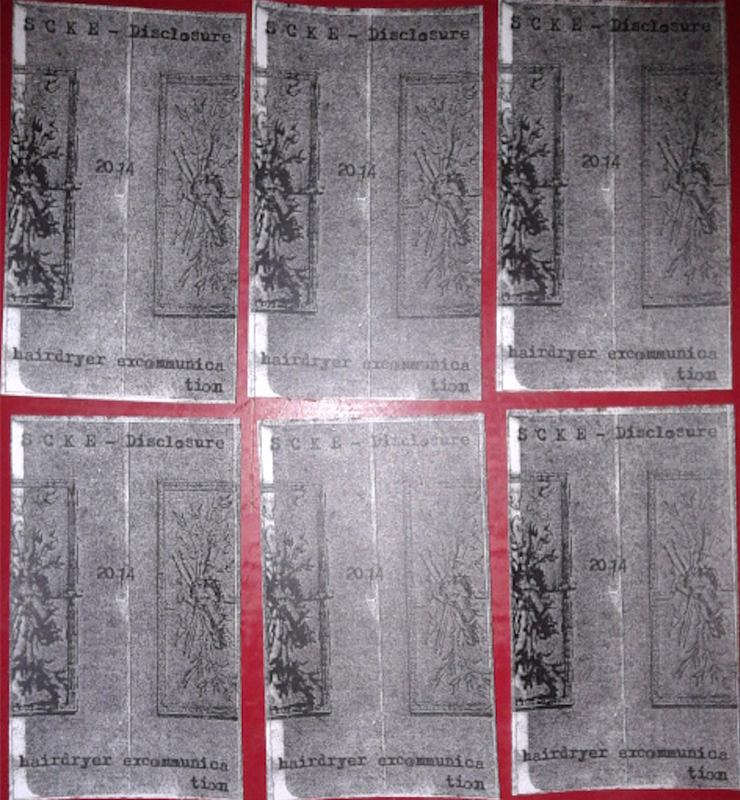 Next up, Kevin Sanders has produced two new 3″ cdrs. The first of which, A decline in aspiration, is available now and the second of which, Circadian escapades, is due out imminently. These recordings offer a slower and more sparse construction than his more recent output, focussing upon acoustic sounds which are then processed, introduced, layered, synthesised, and smelted down. Please note that all monies raised by this month’s hairdryer excommunication releases will be going to Team Harpy. Team Harpy are two brave women, Lisa Rabey and nina de jesus, that publicly criticised the sexually harassing behaviours that were extant among certain members of the library conference circuit in North America. A person named as a perpetrator but did not accuse of any illegal actions, has now decided to sue these women for expressing their thoughts on such behaviour. He is suing for $1.25m. As an American, he has chosen to sue Team Harpy in Canada, where nina resides (but not Lisa), presumably because the Canadian legal system is similarly regressive to the UK’s and he wouldn’t have stood a chance in the US. Smooth move. Patriarchal dominance has given several layers of power and expectation to men to feel that they can do as they please, unchallenged. Scale this up to a professional context where men get to parade their apparent knowledge, skills and futurism, we see that this hierarchical dominance is reproduced in a field that is women-predominant. This starts to build a specific domain of shitness, right? Moreover, this behaviour was discussed privately, creating silos of support and awareness, and this legal challenge is a threat to all women’s ability to disclose, discuss and secure safety in this patriarchal paradigm. The money raised here will be a drop in the proverbial ocean, but everything helps, and using hairdryer excommunication as a vehicle to supplement my personal donations seemed sensible. (You can also donate here.) It also seemed like a discoursally important thing to do: are we up for a debate about gender politics in the no audience underground? I don’t think that our disparate ‘scenes’ are exempt from patriarchal normativity. 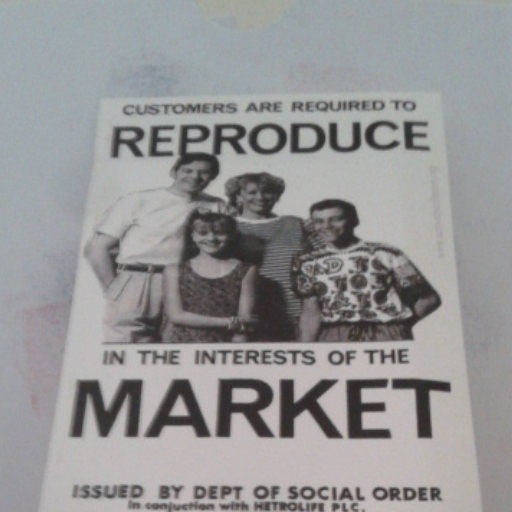 Why don’t we challenge this more instead of reproducing it? Big questions. Following a scheduled cycle from Bath to Portishead, a ride that was cut to a Bath to Bristol ride due to technological ineptitude and a shortage of time, I didn’t really feel like running up a hill yesterday afternoon. You see, thee hXe folk recently took a jaunt over to the south of France and indulged in a bit of outdoors activity. A few sups of rosé wine, a couple of 45km bike rides and walk up a mountain occurred. Uncomfortably healthy. Unnatural. Unnerving. Still, a tan was acquired. My otherwise pasty self knows not how to respond to these chameleonisms. You have to take what you can get, I suppose. 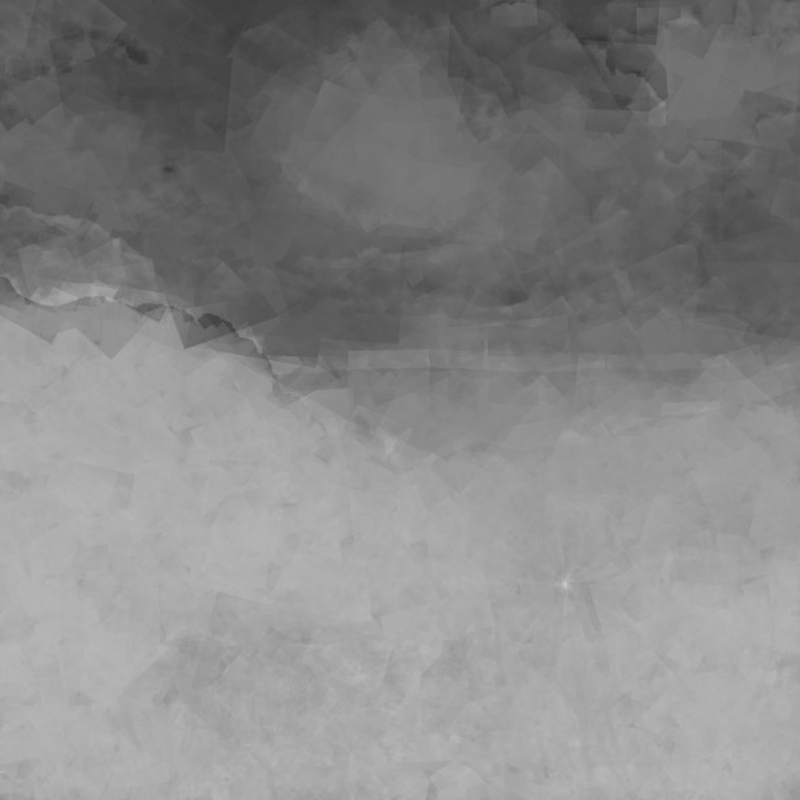 The above image is a digitally created post-cubist view from the top of said mountain. 1200m up, it was harder work than I’d anticipated, which only left the descent. The descent was as philosophical as it was a pain in the arse. Still, I captured a bunch of recordings en route: insects and animals; leaves and flowing water; the breaking of stones underfoot; my energy eeking away; the existential realisation of time seeping away. Add to these some heavy static synth action with some minimal electronics, and you have La peur de Gorges d’Héric. We’re also off to see Kate Bush in a few weeks. We are engaging with popular culture. Whatever next. Running down hills? Sublimity awaits. A busy few weeks hath been had yonder hairdryer excommunication. Gigs at Electric Knife (London, which also was a weekend of much frivolity and joy…) and Audacious Art Experiment (Sheffield), recording in Shipley, meals in Leeds, further recordings sessions in the celestial homespace of Bath and a radio show courtesy of Muhmur Sound Art. On the theme of new material, a new TST release comes via this very source. ‘The spoken truth’ is a vaccum of space crust. Refined minimalist recreations and slovenly filtrations of debris. Lovely oozes of analogue synthesisers hold their own for 18 minutes or there abouts, just long enough to wet the proverbial whistle. Right, I’m sure there’s a ton of other stuff. We’ll get around to updating you all on it soon. Especially you. Another release from Daniel Thomas & Kevin Sanders, but quite different from the last few. Well, sort of. Okay, fair enough, it is still ostensibly a drone composition, constructed from several individual recordings, but there was a programme of induction involved on this release. Alexander Scriabin’s use of the Mythic chord was the basis. It started with Dan telling me about a radio show about Scriabin, then listening the some of his music and learning about the chap’s life. Pretty wild stuff indeed, so Dan I and thought a themed release seemed like a natural progression. Several recordings involving the Mythic chord were made on various synths, mixed, layered, edited, pulled to pieces and then in turn layered with recordings from other miscellaneous sources. Tension is abound: There’s a progression towards a certain euphoria which is followed by a slipping away from that and into something less aware. There was a much heavier editing dialogue present, which evidences itself in the consistency over the 38 minutes of the final recording. 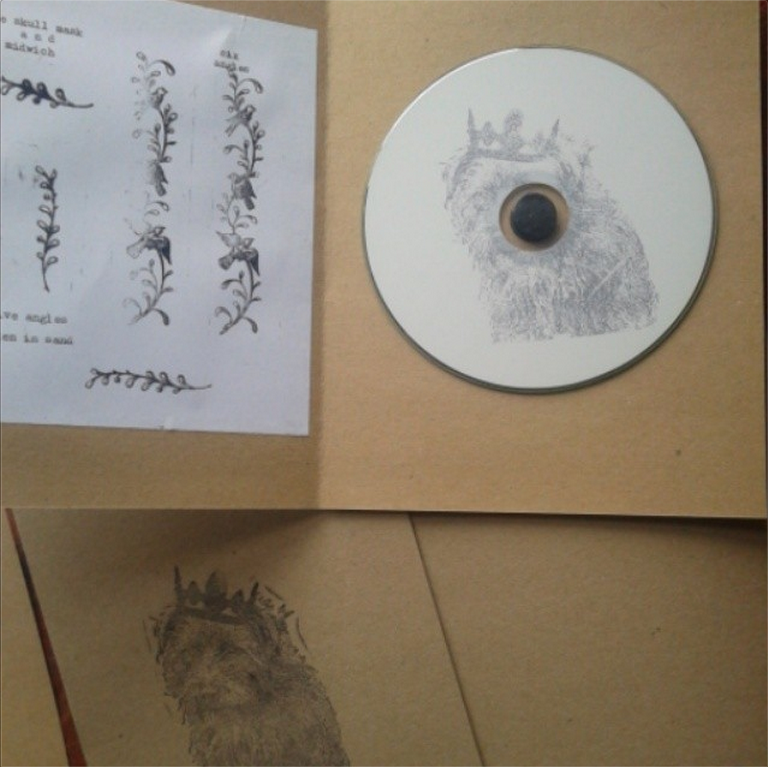 25 copies available on cdr with hand stamps and photocopied addages affixing the disc securely. Dan will have his half before the end of the week. 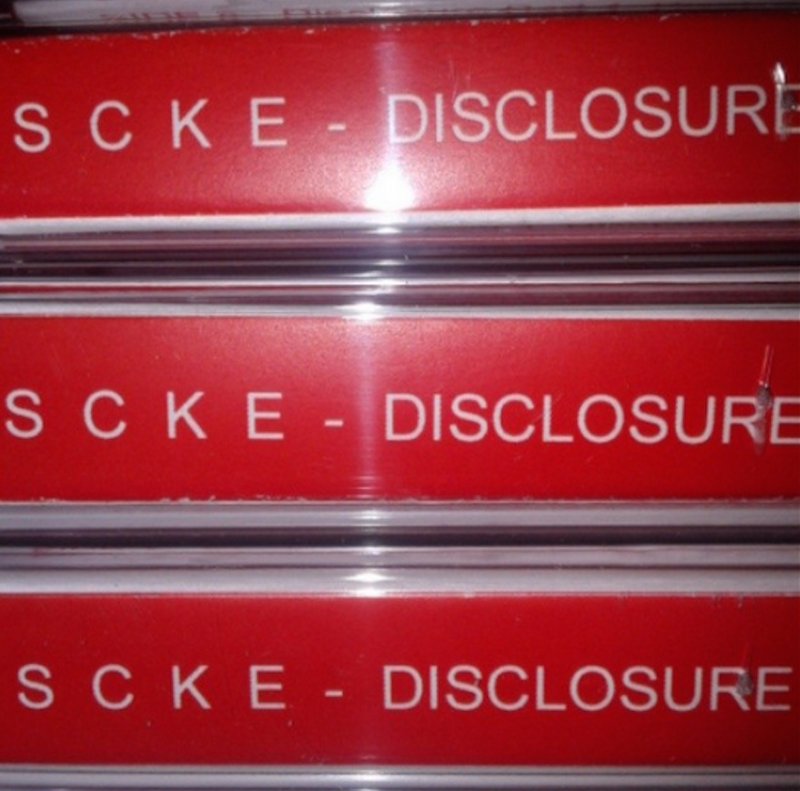 Following several months of heel dragging, I’m finally very pleased to announce that S C K E’s Disclosure cassette (and digital sibling) is now available. Ben will be receiving his half of the press in the ensuing days, so if you live yonder the Midlands, you can pester him directly. Ben’s been garnering a lot of airplay round these parts recently. From the moment that Henry sent me a copy of the Nacht und nebel / W>A>S>P>S 7″, I was predictably hooked. Whatever the approach, project, name or equipment used, Ben has an unfathomable ability to eek out a poignancy that draws the listener in: An ice-melting presence in sound, cascading notions of sublimity. Quite the knack, that. Quite the knack indeed. So what do we have with Disclosure? We have a finely crafted and exquisitely mixed cassette of vintage synth action. Nominal motions are engaged to maximum effect as we are warmed, dried out and set alight over the course of some 43 minutes or there abouts. I’ll leave the write-ups for the critics, but this is certainly one to be enjoyed alone in a dimly lit room, possibly with a scotch based cocktail for company. Disclosure comes on a black cassette, if you are that way inclined. 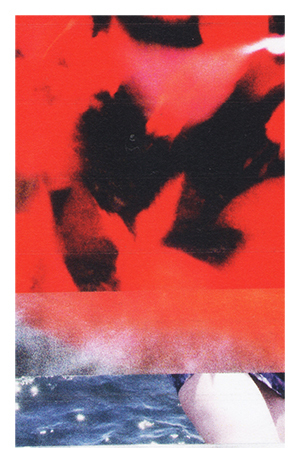 A sleeve (designed by Ben) is served in a ‘distressed’ manner inside a matching red case. 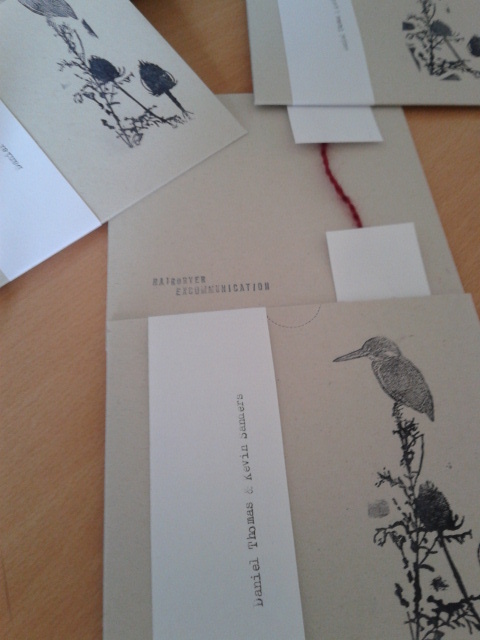 There’s also a little card in there from little ol’ us with the increasingly over-zealous stamp/type/tape triage. 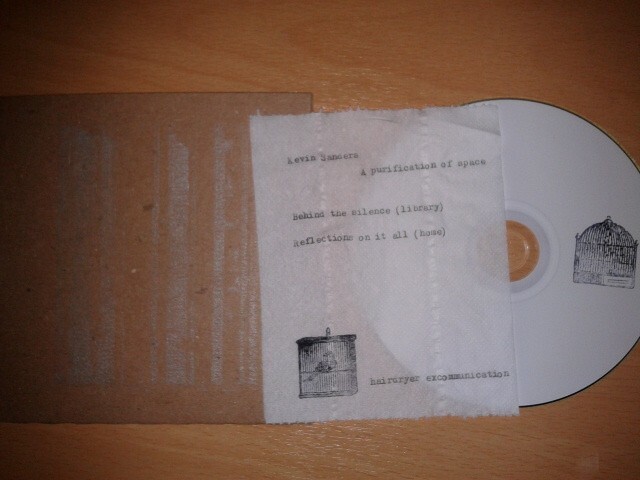 20 copies of A purification of space, a two-track cdr of heavy tape anxieties, are now available. Field recordings of empty library spaces have been slowed down and re-dubbed onto cassette loops, slowed down and re-dubbed on to cassette loops and mixed with sustained vocal wobbles and further tape wobbles, guitar and synthesiser. Some moments of emancipation seemed to get frozen just before corrosion kicked in. What we’re left with is the pre-decay of claustrophobia and intervention in our daily lives as we struggle through the mud, face down in the dirt. 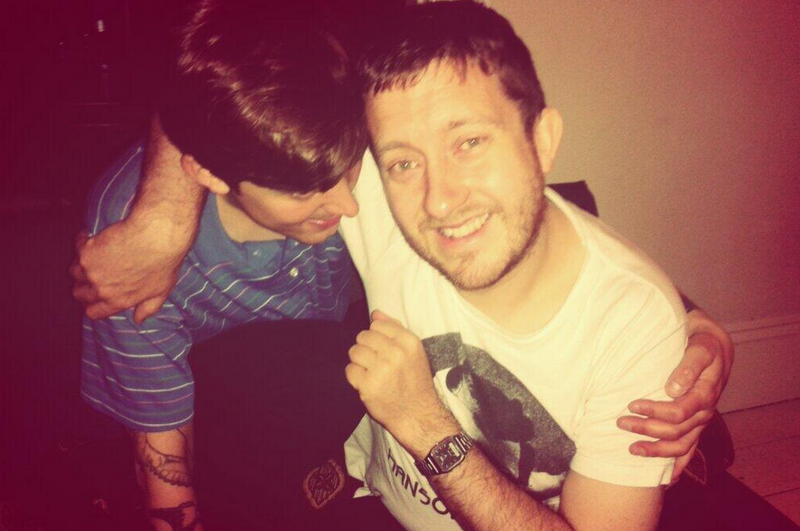 Happy daze! 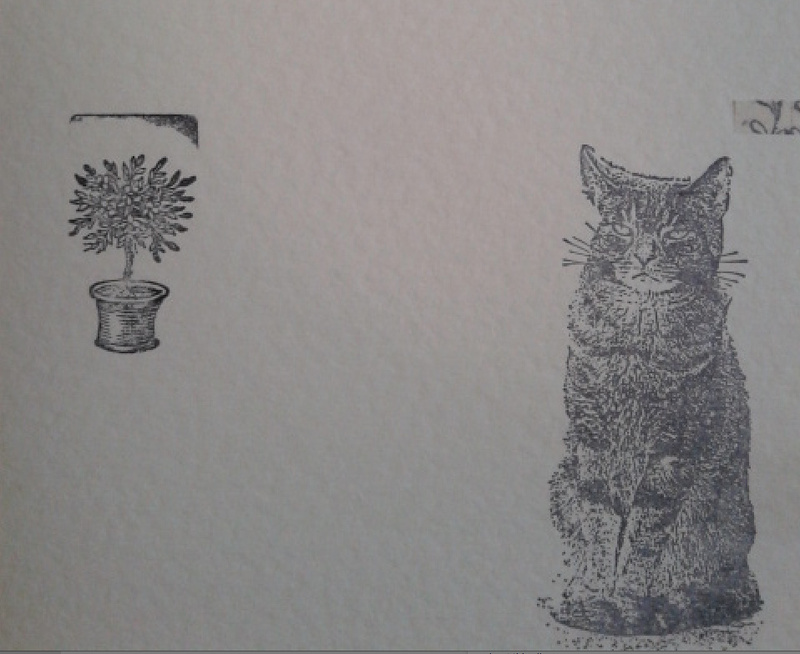 Recycled slip case with silver ink-stamp cover and a typed and stamped slither of tissue paper of liner notes.